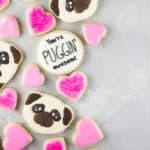 Home » Desserts » You’re Puggin’ Awesome! In case no one’s told you I’m just going to cut right to the chase and say it: You’re puggin’ awesome. You’re puggin’ awesome. You’re puggin’ awesome. You there, way in the back – I see you! You’re puggin’ awesome, too! Growing up I had a Pug and I can tell you, from personal experience, they’re pretty puggin’ awesome ergo someone telling you you’re pretty puggin’ awesome is the highest of compliments. 1. Like the honey badger, they just don’t give a damn ’bout what nobody thinks. 2. They have two speeds: couch potato and turbo. There is no in between. 3. They’re freakin’ adorable (and they know it). Also they will eat literally anything so essentially the Pug is my spirit animal. Always be yourself, unless you can be a majestic Pug… or a unicorn… or a PUGICORN. Guys, I’m going with that last one and it’s my final answer. 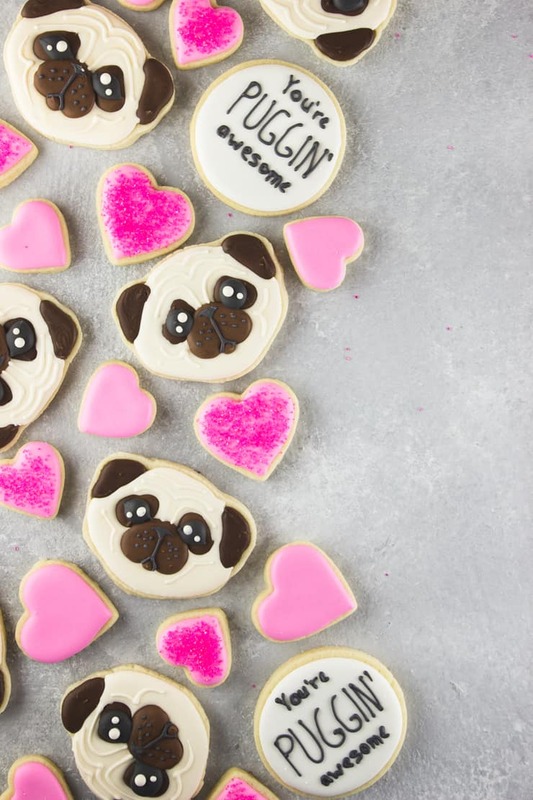 So this Valentine’s Day, let that special person in your life know just how puggin’ awesome they are with these sweet pug cookies. And don’t forget to download this FREE cookie cutting template I made for you just because I love your face. Bonus Pug fact: A group of Pugs is called a grumble. Seriously, how can you NOT love that. Signed, sealed, delivered – I’m sold! 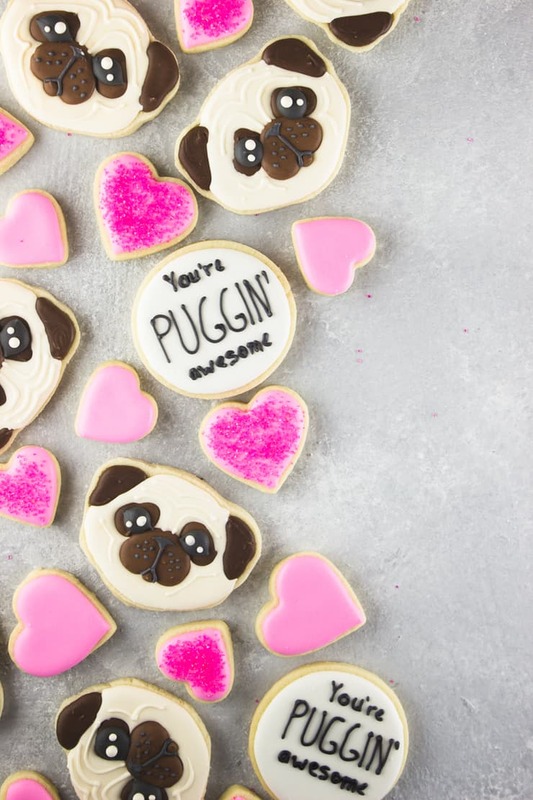 Let your Valentine know you think they’re puggin’ awesome with these pug inspired cookies! 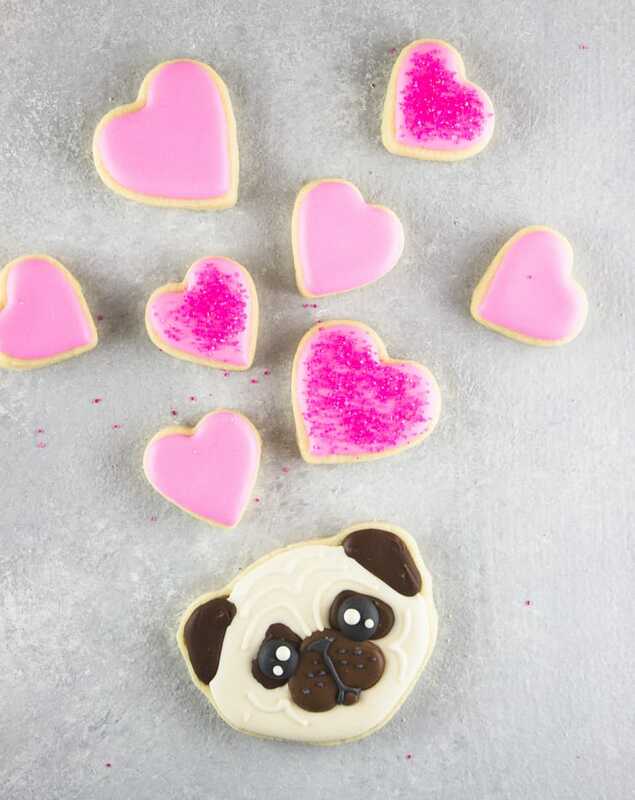 Print and cut out the Pug cookie template. Cover the template in packing tape and cut it out again. This will help protect the template from the butter in the dough as well as make it a little stiffer and easier to cut around. 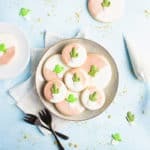 Mix your royal icing until it reaches a 20 second consistency (meaning icing scooped up and dropped back into the bowl takes about 20 seconds to full reabsorb). Place your template under a piece of parchment or wax paper. Scoop about 1/2 cup of royal icing into a bowl and color it dark brown. Pour the icing into a tipless piping bag or a piping bag with a small round tip. Using the template as a guide, pipe the muzzles onto the parchment/wax paper. Allow to dry completely (about 5 hours). Save the remaining icing for the ears and eye area. Make one batch of sugar cookie dough per the recipe instructions. Roll the dough out to ¼” thick on a lightly floured surface. Using a sharp knife, cut out your cookies using the template provided. Place the cookies on a parchment paper lined baking sheet and bake at 350F for 7-8 minutes, or until the surface is no longer shiny. 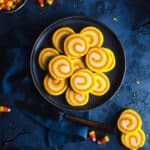 Once the cookies have cooled completely, you can decorate them. 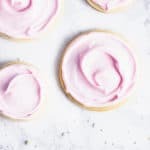 If you need some guidelines for piping, you can cut up your cookie template and trace the pieces on using a food coloring pen. Using the leftover brown icing, pipe the ears and the eye area. Spoon 1/3 of a cup of the white royal icing into a separate bowl and color the remaining icing a light ivory color. Pour the ivory icing into a tipless piping bag or a piping bag with a small round tip, and fill in the rest of the face. Immediately add the royal icing transfer muzzle on top of the still wet ivory icing. Divide the remaining white icing into two portions and tint one black. Use the black and white royal icing to create the eyes and details on the muzzle. Let the icing harden completely before packaging. I LOVE these….those cute, wrinkly faces and those eyes…. 🙂 YOU are Puggin’ Awesome!! Dude, a grumble? That is freaking awesome. These cookies need to happen in my life. That are just too cute! Lol. We are back to the puns, huh? That is funny. As a dog lover, I agree that you are puggin awesome. Oh my! These are just so cute! I shared this to my facebook wall! I also had no idea that a group was called a grumble! Learned something. Oh, wow! These cookies are seriously the cutest ever! These are so cute!! 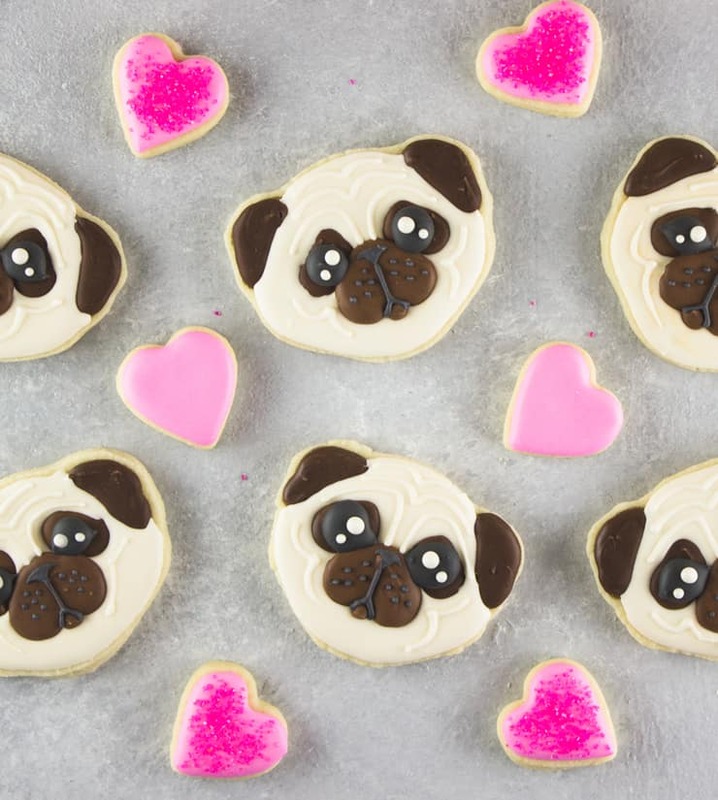 I would love these as little treats for the kids party.. who can resist cute pug cookies..! LOL so cute. My guy would get a kick out of these! These puppy cookies are so cute! 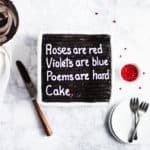 Kids would go crazy for these Valentine’s treats. this is such an adorableeeee idea! This might be the cutest thing I have seen all day! I absolutely love the eyes! Ahh! 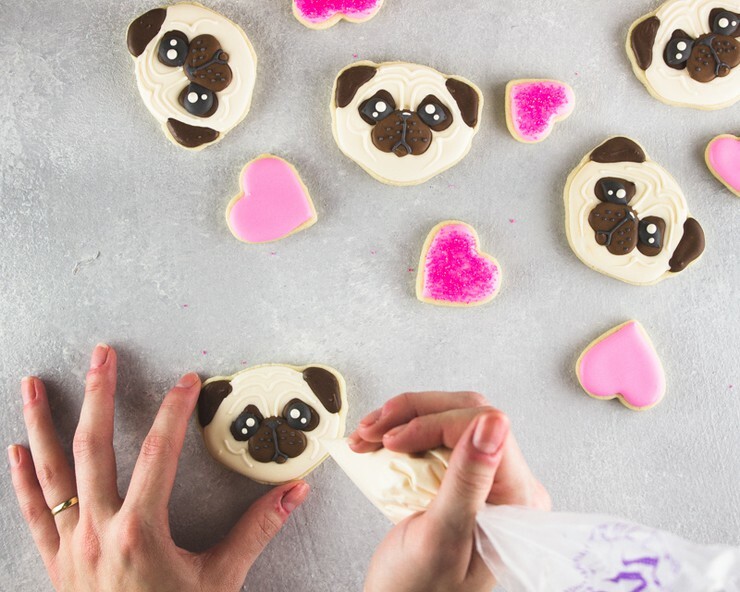 These cookies are adorable, and you NAILED the wrinkly little pug face. They probably aren’t totally appropriate for my kids’ V-Day parties, but that would just mean more for me. I puggin’ love these cookies. And yes. Pugicorn! Gorgeous! These are so cute!!!! Almost too cute to eat!